For many of us, our home is our biggest investment as well as our family refuge. Losing a breadwinner can wreak havoc on the family’s finances — and their ability to stay in the home they love. So, what’s the best way to protect your home in case something happens to you? Here are two options: mortgage protection insurance and traditional term life insurance. If you’ve recently closed on a mortgage or home equity line, you’ve probably received a flood of solicitations for mortgage protection insurance — usually disguised as official communication from your mortgage lender with few details on what they’re selling. Mortgage protection insurance (MPI) is a type of life insurance designed to pay off your mortgage if you were to pass away — and some policies also cover mortgage payments (usually for a limited period of time) if you become disabled. Note: Don’t confuse MPI with private mortgage insurance (PMI), which protects the lender if you default on the loan. With PMI, your family would still owe the balance of the loan if you passed away. Guaranteed approval. Even if you’re in poor health or work in a dangerous profession, there is guaranteed approval with no medical exams or lab tests. No guesswork. The check goes straight to the lender for the exact mortgage balance, so there’ll always be enough and your family won’t have to handle the money. Disability protection. Some MPI policies make mortgage payments (usually for a limited time) if you become disabled or lose your job. What’s not so good about MPI? Lack of flexibility. MPI gives beneficiaries no choice. The insurance pays off the mortgage — nothing else. This means your family can’t use the money for anything else. Higher cost. MPI typically costs more than term life insurance, especially for healthy, responsible adults. And some policies don’t guarantee the price will remain the same over the term of coverage. Shrinking coverage. As your mortgage balance declines, the policy’s payout declines with it. That means you’ll end up paying the same cost for less coverage over time. More restrictive age limits. MPI policies often have more restrictive issue ages than term life. For example, some insurers won’t issue a 30-year MPI policy to anyone over age 45. This product is often a better bet for people who are in good physical and financial health. Let’s take a closer look. Term life is designed to pay a benefit to the person(s) or organization(s) you designate if death occurs during a specified period of time. You pick the benefit amount and the time period. The price and benefit amount generally stay the same for the entire term. What’s good about term life? Plenty of flexibility. Your family can decide how to use the proceeds. They can use it to pay off the mortgage — or for something else like replacing lost income, investing it for retirement, paying tuition or covering pressing costs like burial expenses. Lower cost. Term life can be very affordable — and probably costs less than you think. In fact, 85% of consumers overestimate its cost. Coverage never decreases. The coverage amount you select when you apply will remain the same throughout the entire term of coverage. Price never increases. With traditional term, the price is guaranteed to remain the same for the length of the coverage period. The cost for many MPI policies can change later. Less restrictive age limits. Term life is generally available at higher ages than MPI. For example, Grange Life issues 30-year term policies up to age 55 that last to age 85. Extra protection. Some term policies offer “living benefits” in addition to a death benefit, allowing you to access the death benefit early under certain circumstances (like terminal illness). What’s not so good about term life? Approval usually isn’t guaranteed. Most people can qualify for coverage — though the price may be higher for those with health, driving or financial issues. Coverage isn’t coordinated with your mortgage. So, you need to make sure you select enough coverage to cover the balance of your mortgage. Your family will be responsible for sending the payment to the lender. And as your mortgage balance decreases, more of the death benefit would be available for your family’s other needs as well. With MPI, there will never be additional money going to your family. If you own your home free and clear, MPI could be a waste of money. And most people don’t need MPI if they have sufficient life insurance (even if those solicitations say otherwise). If you don’t have enough life insurance, consider getting more. Term life will likely be a more flexible and more affordable option for those who qualify. However, for those who have trouble getting traditional life insurance, MPI can provide important protection that might not otherwise be available to you — and the extra cost may be worth it. Before you decide, get price quotes and contact your local independent insurance agent to see if you’d qualify for term life insurance. Your Grange Life agent can help you choose the right type and amount of life insurance to fit your needs and budget. Don’t have an agent? You can find a Grange Life agent near you. Love comes in all shapes and sizes. Life insurance does too. 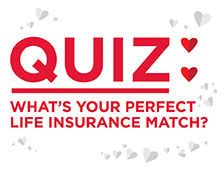 Protect those you love the most by learning which type of life insurance is best at every stage of your life. Use this infographic to find your perfect match.